The Mercedes-Benz Grow Up campaign focused on the New Generation Compact Car range. Of the top three premium vehicle brands, Mercedes-Benz was viewed as the most traditional. Mercedes-Benz set out to re-energise this brand perception. The campaign tapped into the cultural truth that people are unwilling to let life stage and subsequent responsibilities steal their youth. Through this insight, the Grow up campaign was born. Each model was assigned its own statement which set to confront traditional social norms and celebrate the qualities that are prevalent in the younger generation of today. Four long-form videos formed the core of the Grow Up campaign. Our brief was to bring these video assets to life in social, for a local audience. Our challenge, in a channel where consumers can move past advertising with the flick of a finger, was how to stand out. Online Circle Digital proposed a social video series that had never been delivered before. At the core of our campaign were Canvas Ads, a new ad format released in 2017. 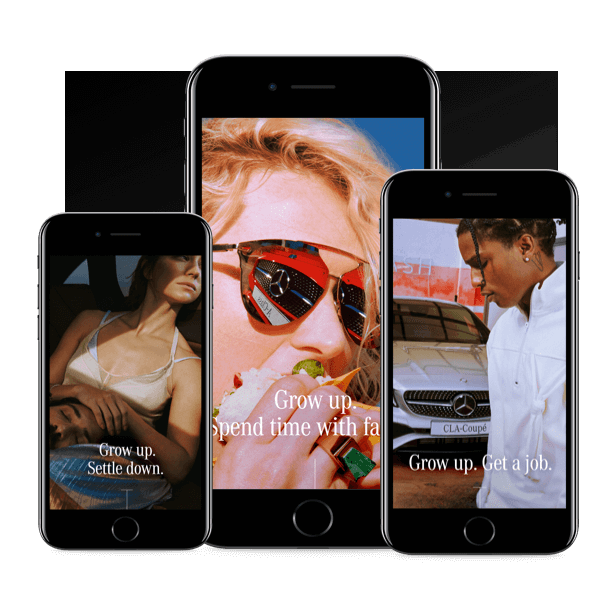 With interactive video and image functionality, we set out to create an immersive, interactive campaign that fully embraced this new format. Unlike other brands who used Canvas Ads as a single piece of communication, we interlinked a series of individual Canvas Ads allowing our audience to move from one story to the next. This seamless experience was a first-in-market execution and allowed our target audience to engage with the entire video series without ever leaving the ad. Our second challenge was to keep consumers engaged for the two-month duration of the campaign. Prior to the launch of the video Canvas Ad series, we released teaser videos for each model to build hype for the campaign launch. Each Canvas Ad was individually targeted to specific audiences based on those who had engaged with the teaser ads and current Mercedes-Benz owner data. We set up an audience retargeting pool for anyone who had engaged with the video Canvas Ads. They were served models that they had not yet engaged with. We continued additional nurturing and retargeting across other social video ad formats such as video carousel ads. we appealed to a younger target audience.